The Portland Design Works Shiny Object offers regulated CO2 inflation in a simple and compact design. The alloy body is durable and stylish and the control knob makes inflation easy. Works with Presta and Schrader valves. Takes a 16g threaded CO2 cartridge (sold separately). Works great when it does, I like the onoff control of CO2 flow. But after a few uses the rubber O seal that wraps around the stem literally blew up. This shiny object works great, it is so easy to regulate the flow and it will hold the leftover CO2 for days. Its small and light. You can't ask for anything more. The simplest, no fail, CO2 inflater I've used. I have a Lezyne and Innovations valve inflators, but have replaced both with the PDW inflator. The PDW is the easiest, quickest, and fail-safe nozzle compared to the other 2. I inflate in 2 steps. At step 1, my PDW allows me to have very slow, controlled release (twist the valve knob) to minimally inflate the inner tube, but with enough air control to see the tire is properly seeded inside, around the rim. My Lezyne and Innovations is simple push, but each push comes in full bursts. I found these bursts are more difficult to control in my step 1. Step 2 is my more robust, but still controlled, release to reach my desired PSI. There are certainly experts using Lezyne and Innovations, but I'm not one of them. I don't flat that often. But, when I do, the PDW has ridden me of all my previous fumbling and frustrations I had with the other 2 brands. Used this yesterday for a flat. Works great. Not much else to say! less than a week after receiving it, I had a flat. Product worked perfectly and allowed me to gently release C02 into the tire to seat the bead. Compact inflator, easy to use, well made. I like the ability to control the flow much better than cheaper models that are all or nothing. This was a gift to replace a lost/stolen one and my son likes it very much. Rubber seal inside blew out!!!! Don't buy this!!! the rubber seal inside blew out the first time I used it. You can no longer use this once the rubber is broken. Great product, lightweight, user friendly, It's nice being able to regulate the air flow. This is just one of those products that does exactly what it was designed to do and does it well. It's great to have such a small, functional pump to carry. I had no idea pumps could be this small until it showed up at my door. Very nice pump and as always Western Bikeworks delivered it very quickly. Great lightweight inflator, super easy to use. I have not using it yet! 2 of 22 customers found this review helpful. I have not using it yet, but it should work the same with the non-threaded CO2 case. It is should be lighter and easy to use. This is awesome, you get to regulate the amount of CO2 used and how fast or slow.No more losing all your CO2. The Portland Design CO2 Inflator works great. I really like that it has an adjustable air release valve. You can slowly fill the tire with a lot of control. Just a great product. Finally had to use this in anger the weekend and I was pleasantly surprised. More controllable than I had thought it would be. THe valve is smooth and you will be able to let in just a little or a lot with ease. Stores in a tiny space. My fizik bag easily holds this, two cylinders (16grams), a tube, multitool, and spoke wrench. even if I get picky I cant find any issue with this at all. This product works great so far. I (knock on wood) have only used it a couple of times. 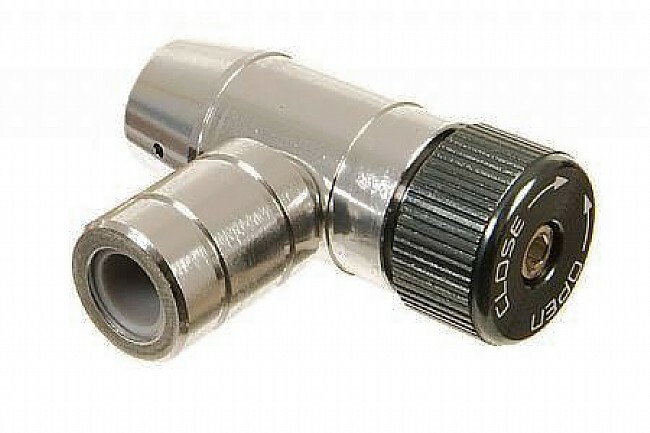 The adjustable pressure valve makes it easy to put the C02 into the tube. It is mostly metal, so I anticipate it lasting. I received two back to back flat tires in the beginning of an 75 mile ride to Piermont and back earlier this week. This tool definitely came in handy. It is compact and easily fits in a saddle pouch or jersey pocket. It is made of quality materials and I love the fact that you can vary how much CO2 is being released via the vale. The changed tires were inflated in seconds and I was on my may. Funny enough, one of my riding buddies suffered a flat on the way back (on the same trip). It was my first time using the tool and I had the opportunity to use it 3 times in one day. All in all, well worth the money.